Stefan Jacoby: Volkswagen's top U.S. executive for nearly three years has cut costs, designed the first models for the U.S. market, added an assembly plant in Tennessee and moved the headquarters to Virginia from Michigan. BERLIN (Bloomberg) -- Volkswagen AG is negotiating with U.S. chief Stefan Jacoby over terms of his departure as the executive is set to become CEO of Volvo Cars, according to people familiar with the matter. Jacoby, 52, will replace Stephen Odell, 55, at Volvo Cars, said two people with direct knowledge of the matter, who asked not to be identified because the matter is confidential. Jacoby’s talks with VW focus on his contractual obligations to the German carmaker before he leaves, one of the people said. Jacoby has been Volkswagen’s top U.S. executive since September 2007. He has cut costs, designed the first models for the U.S. market, added an assembly plant in Tennessee and moved the headquarters to Virginia from Michigan. His leaving could result in a drain of production know-how to Volvo, the Swedish automaker Zhejiang Geely Holding Co. is taking over from Ford Motor Co., said Aleksej Wunrau, an analyst at ING BHF-Bank AG in Frankfurt. “Jacoby’s departure would be bad news for VW” and may cause frictions within VW’s U.S. operations at a time when the Chattanooga plant is about to be opened, Wunrau said. Michael Lohscheller, who has been in charge of finance in the U.S. since 2007, will run Volkswagen Group of America on an interim basis, while Mark Barnes will do the same for the Volkswagen brand until Jacoby’s “contractual situation has been clarified,” VW said in a statement late yesterday. Volvo Cars’ new management team is up to Geely to confirm, said John Gardiner, a spokesman for Ford of Europe. Yuan Xiaolin, a spokesman for Geely in China, didn’t answer calls to his mobile phone. Per-Ake Froberg, a Volvo spokesman, didn’t have a comment. Geely is buying Volvo from Ford for $1.8 billion in the biggest overseas purchase by a Chinese automaker. Volvo’s leader will have to stanch plummeting sales to return the company to profit while tapping growth in China, which surpassed the U.S. as the world’s largest auto market in 2009. Volkswagen aims to sell 1 million cars and sport-utility vehicles in the U.S. by 2018, with its Audi luxury division accounting for 20 percent of that figure. VW is aiming to dethrone BMW AG as the largest luxury automaker. VW sold about 214,000 cars in the U.S. in 2009, excluding Audi. The company aims to more than double the figure to 450,000 by 2012 to 2013, Jacoby said in January. The assembly plant in Chattanooga, Tenn., will start building next year a sedan model aimed at U.S. consumers that is bigger than other VW cars, Jacoby said March 31. Jacoby started working for Volkswagen in 1985 in the industrial sales controlling department, according to his company biography. He worked for Volkswagen of America in 1988 in the controlling and marketing departments, before moving to Japan where he stayed until the end of 1992. From 1997 to 2001 he was responsible for VW’s Asia-Pacific region. Jacoby left Volkswagen in 2001 to work for Mitsubishi Motors Corp.’s European operations. 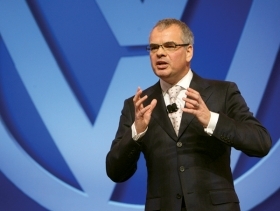 He returned to VW in March 2004 and became Volkswagen’s global sales chief later that year.